It's also confirmed on Capcom Unity, in case anyone was doubting it. From what seems to be suggested, I believe it's keeping all the Japanese vocals with translated text, so no confirmation of English voices at this time. Anon wrote: "Japanese vocals with translated text"
not really undamed, no one is gonna know what they are saying during attacks, because those parts will not have subs. Lets not get into subs vs dubs because different people have different opionions. USA DANTE > JP DANTE ;p. At this point as long as it comes over I'm happy. Namco is slowly inching it's way back into being decent and good in my eyes....! I didn't expect it to happen. But I'm pleasantly surprised. Good for Namco then. Just hope that the rights on some franchises and characters won't be a huge problem as with some other titles prior. Oh well. Not like Mark Gatha could have reprised his role anyway. ...which is a shame, honestly. Granted, I'm sure that being a doctor pays more than being a voice actor, but I miss his voice. Awwwww, I was hoping they'd get Frank West's original voice actor. It's going to be weird hearing him and Chris Redfield speaking in Japanese. Though, that's just a minor complaint. The thing I care about is that we will actually be getting this game. I'll be sure to have this pre-ordered. I know, right?! All hail Namco Bandai, the greatest gaming company in the world! O3O No srsly this was too awesome to wake up to! I had made arrangements with a co-worker at my new job to buy his old 3DS (a blue one like I wanted! with extra accessories! and the original box and everything! and it's a launch unit!!) and it's at work waiting for me!!!!! Today's the day I get it! I woke up (I work 3rd shift so yeah waking up at 5 PM is normal) and see texts from my brother-in-law and my sister that this game is confirmed TODAY?! The day I'm getting my 3DS?!!? EEEEEEEEEEEEEEEEEEEEEEEEE *POP* BEST. MORNING. EVER!!!! Great news, though I wish it was for one of the home consoles instead of the 3DS. @Amir, actually, according to Gamefaqs and Namco Bandai website, they're still called Namco Bandai in the USA and Bandai Namco in Japan. Awesome. Now that I actually have a 3DS, I'll definitely be sure to pick this one up when the time comes. Uh... Protodude stated that there are no licensing issues, so every character from said series will be playable. Dr. Jerk said that before Protodude updated the post with that info. 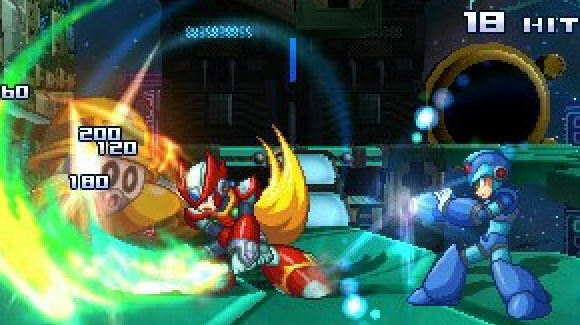 This is cool, but it would better if they're making a new Mega Man game. "What’s more, the rep added that the game will feature Japanese voice options and English subtitles for those who prefer it." This is the opposite of Destructoid and Silicon Era's coverage, hinting at an English voice track. Destructoid isnt exactly accurate when it comes to game coverage and now I'm starting to question Silicon Era (not that I ever followed them to begin with), but that quote from VG24/7 makes me wonder if everyone else mistranslated the developer's statements.